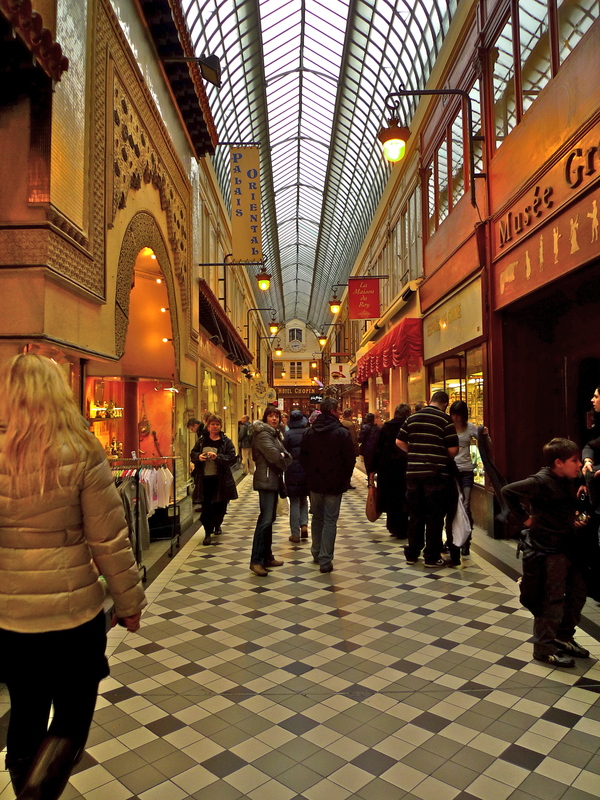 LES PASSAGES COUVERTS, or arcades as they are known in English, conjure up a wonderful picture of Paris in the first half of the nineteenth century. 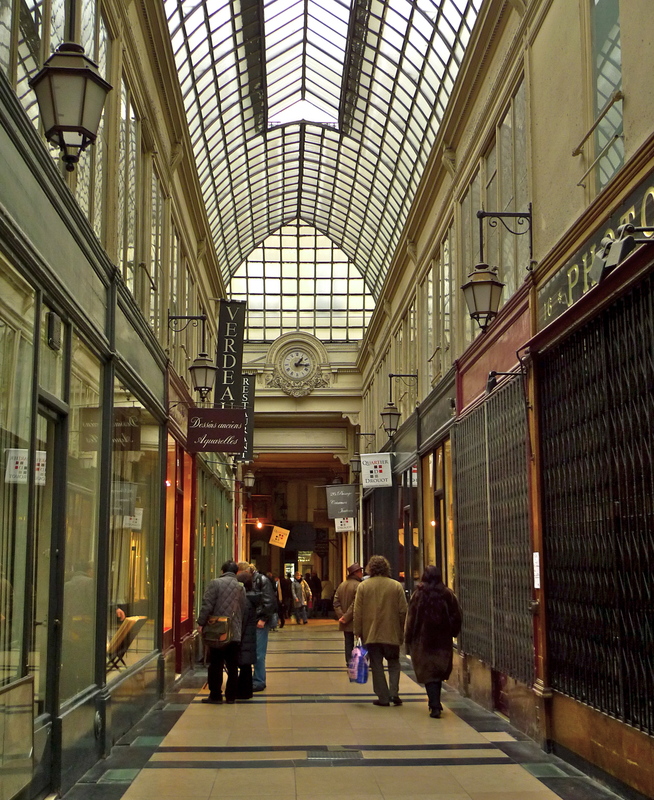 The history of the passages couverts goes back to the Galerie de Bois in the Palais-Royal. Built in 1786 by Philippe d’Orléans, the Galerie was open to the public for a variety of commercial and entertainment purposes – some more savoury than others. Whilst the Galerie de Bois was built in the classical style of French public architecture of the time, the new arcades begun at the turn of the nineteenth-century represented everything that was modern. “These arcades, a recent invention of industrial luxury, are glass-roofed, marble-panelled corridors extending through whole blocks of buildings, whose owners have joined together for such enterprises. Lining both sides of the corridors, which get their light from above, are the most elegant shops, so that the arcade is a city, a world in miniature, in which customers will find everything they need”. So says the ‘Illustrated Guide to Paris’ of 1852. The 1820’s and 1830’s marked the heyday of the passages couverts. In all, 150 were built of which around 20 survive today. In the early nineteenth century, the idea of ‘indoor shopping’, with a collection of shops sitting cheek by jowl offering a wide variety of merchandise, was as new as the arcades that provided it. Before the arcades appeared, shopping in Paris was a hazardous business. There were no pavements, the uncertainties of the Parisian climate and the level of street filth and mud made Paris an unsavoury place – not to mention the constant risk of death in the streets. As Baudelaire said, ‘death comes at the gallop from every direction at once’ . The concept of a group of shops, inside, under cover, was an attractive proposition to the Parisian public. I suppose we can say that these arcades were the first ‘shopping malls’ that our consumer society seems to be so much in love with today – but now we do it on an industrial scale and with far less elegance. 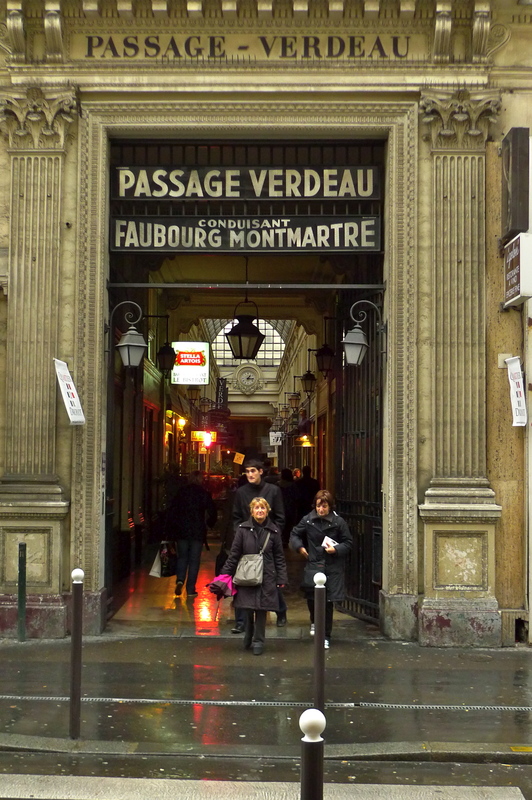 In the bottom right-hand corner of the 9ème arrondissement there remain two passages couverts – the Passage Verdeau and the Passage Jouffroy. Both are on the north side of the Boulevard Montmartre. Cross that Boulevard into the 2 ème arrondissement, and directly ahead, and in line with the other two, is the Passage des Panoramas, not only the first arcade to be opened but the first to be lit by gas lamps. All three are well worth a visit. 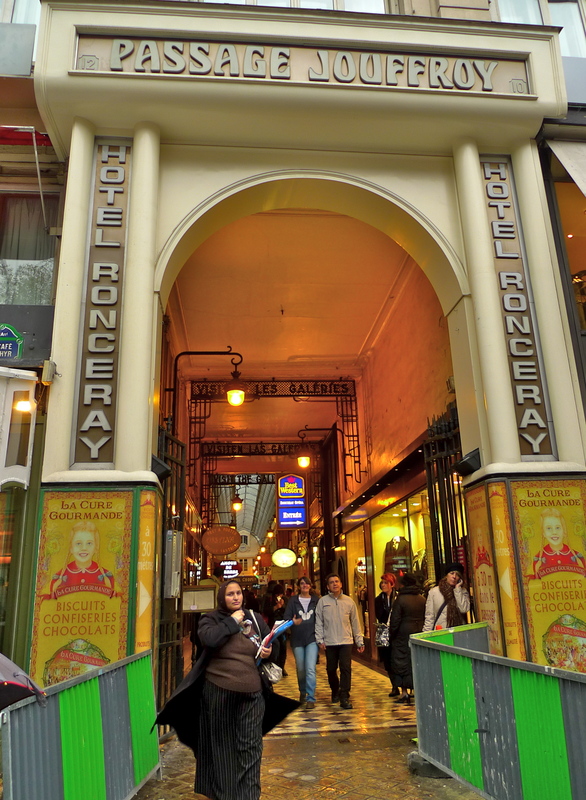 Built in 1847, the Passage Jouffroy was the first passage couvert to be built entirely of iron and glass and the first to be heated. Throughout its life it has been home to shops selling a wide variety of merchandise – from books and post cards to La Boîte à Joujoux, with its magnificent collection of doll’s houses and all things miniature, to G. Segas, famed for its selection of walking sticks and other curiosities. 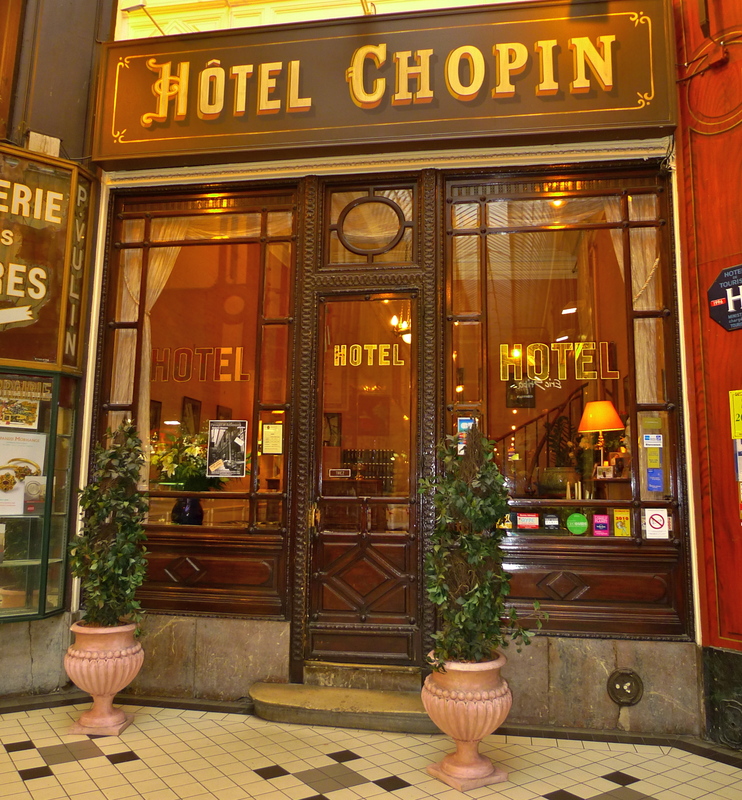 And speaking of curiosities, tucked away at one end of the Passage Jouffroy is the Hôtel Chopin. Surely one of the more curious locations for a hotel. 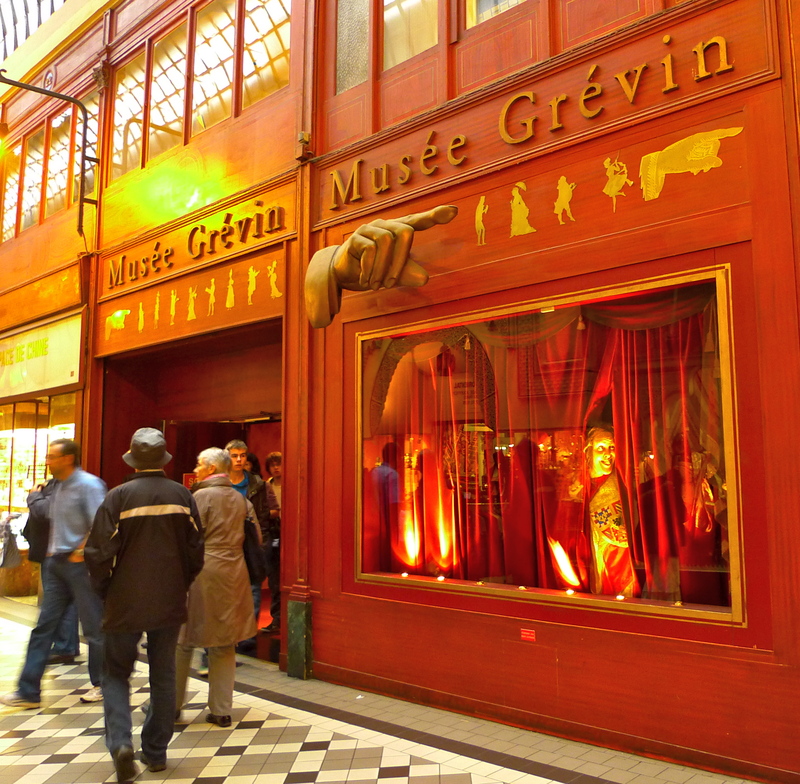 At the other end of the Passage Jouffroy is another curiosity, the Musée Grévin – a waxworks museum. The decline of the passages couverts owed much to Haussmann and the Grands Magasins – the department stores – another French invention. Over the years, many of the passages couverts fell into decay and a good number disappeared altogether. Thank goodness the Passage Jouffroy and others have survived to be restored to their former glory.